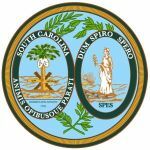 This morning, SC Equality and Palmetto State citizens gathered in front of the state Senate Corrections and Penology Committee to testify against S. 1062, a bill that would prohibit the state’s department of corrections from providing hormone therapy to transgender inmates. [The bill is] Unconstitutional because like Wisconsin’s bill, this one will be found in violation of the 8th and 14th Amendment. Pointless, because when SC Equality contacted the SCDOC to request the number of transgender inmates, they replied that they knew of NONE! The bill was amended “to address Ms. Johnson’s concerns” so that inmates who are already on hormone therapy cannot be denied therapy while in prison. It is still unconstitutional and will no doubt face a court challenge. When the potential court challenge was brought up, the sponsor and committee members laughed aloud blaming liberal activists judges for the problems. Johnson wasn’t the only Palmetto politico speaking out on the measure this morning. A spokesperson from the transgender community testified at the hearing this morning with the arguments of cruel and unusual punishment and the unconstitutionality of s.1062. Simply put, the cruelty would be on the taxpayer footing the bill for theses procedures costing 10’s of thousands of dollars. Also, I’ve never been one to check with the local liberal activist judge for permission on every piece of legislation. If we were to start paying for “Dan” to become “Danielle”, were would we house the inmate? How can we protect the scarce funds of the already least funded department in the U.S.? Respect for the law and Constitution? Nada. Respect for human dignity? Nada. Respect for equal access to legitimate healthcare? Nada. Respect for the American judicial system and its purpose? Nada. Nada. Nada. What exactly is it that Republicans stand for again? Surely, the “Party of Lincoln” hasn’t become this heartless and disrespectful. Scratch that — Yes, they have. Yesterday’s post on Greensboro City Councilmember Trudy Wade was harsh — I admit it. But, certainly it wasn’t any harsher than the painfully bigoted position Wade took heading into last night’s debate on a resolution to oppose the state’s anti-LGBT, anti-family constitutional amendment. The resolution passed 7-1, with Wade the lone dissenter. Wade had wanted to postpone last night’s debate on the resolution. 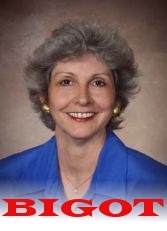 She insisted that the city should hold public hearings on the matter, despite the fact that her Republican colleagues in the North Carolina House and Senate failed to just that, rushing the proposed amendment through the committee process in the House and attempting to conceal its identity in the Senate. But, nonetheless, it was a public hearing Wade wanted and a public hearing Wade got. From the looks of the livetweeting last night by @racetotheballot, @nc4equality and others, Wade got more feedback than she’d ever need. So much so, that the Greensboro City Council decided to take a 10-minute recess in the middle of the public comment period. In Mourning: Trudy Wade comes to the realization that bigotry isn't a winner. And, while all this was going on, Dear Trudy (in center, photo at right) stayed silent. Her somber mood and her in-mourning-like dress was all quite fitting. If you’re going to stand up for evil, might as well wear its colors. There were few people who spoke out against the resolution and in favor of the amendment. Of those who did, however, one person stood out of the pack. 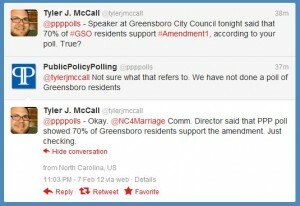 Tyler J. McCall, an activist with Neighbors for Equality, tweeted that communications director for Vote For Marriage NC, the referendum committee pushing for the anti-LGBT amendment, shared not-so-accurate facts. 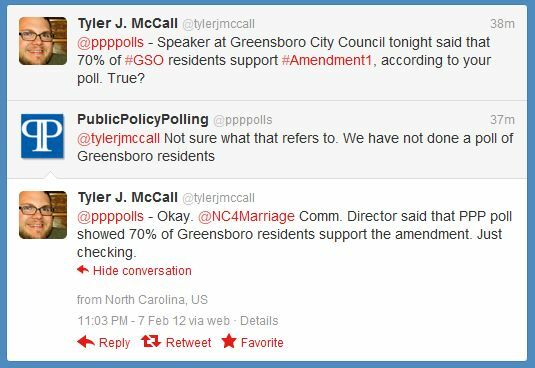 According to Tyler, the NC4Marriage rep said Durham-based Public Policy Polling had found that 70 percent of Greensboro residents were in favor of the amendment. To his credit, Tyler sniffed a rat in that mountain of a woodpile. Tonight, the Greensboro City Council will consider a resolution opposing the impending anti-LGBT constitutional amendment set to go before North Carolina voters on May 8. 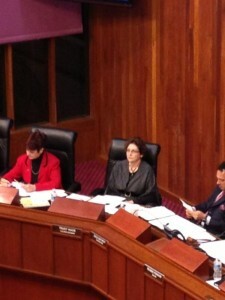 Still, Councilmember Trudy Wade says she is opposed. She stands in favor of the constitutional amendment and wants to postpone tonight’s vote in order to conduct public hearings. The May 8th election is an important one for the future of our state. The very basis of our legal system — our Judeo-Christian principles — is on the ballot. I hope that each citizen will register to vote and make sure that conservative family values are not compromised in our great state. Let me put this as plainly as I can: Mrs. Wade, you are a bigot. In what just world is it appropriate to support a constitutional measure that forever encases an entire minority of people in second-class citizenship? Would you have supported public votes on any number of this country’s other historic civil rights measures? If your answer is yes, you’re even more of a bigot than you appear. If your answer is no, then you’re just an anti-gay bigot. Either way, you’re a bigot. On Sunday, I started up a last-minute campaign to raise awareness on the anti-gay history and records of seven incumbents on the Winston-Salem/Forsyth County Board of Education. It was a last-ditch effort to get folks out to the polls and aware of some of the outrageous statements and behavior of board members Buddy Collins, Jane Goins, Victor Johnson, Donny Lambeth, Jeannie Metcalf, Marilyn Parker and Jill Tackabery. For three years, Winston-Salem’s CHANGE (Communities Helping All Neighbors Gain Empowerment) had led the effort to turn the education races from partisan to non-partisan and to raise awareness on issues like school choice and diversity. It was a valiant effort, yes. But it came too late for any real good. I know that. All of the WSFCS Board of Education’s incumbents were reelected yesterday. There was one positive outcome: Lori Goins Clark, incumbent Goins’ daughter, was not successful in her bid for office. Had she been elected, she would have been the eighth anti-gay member of the board. West Forsyth High grad and straight ally Mark Shields addressed that point perfectly in a May 2010 letter to the editor on Metcalf’s history and Clark’s position on bullying. Perhaps, in the future, a more organized campaign can be mounted to finally oust these members and vote into office true defenders of education — people who will vow not only to educate our young people but also keep them safe while these youth are in their care. Until next time… keep on keeping on. It’s a year of anti-incumbency. All across the nation, conservatives and Tea Partiers are pushing to oust any and all incumbents who haven’t stuck to their hard-core anti-establishment, anti-immigrant, anti-working class, anti-gay, anti-[fill in the blank] agenda. Yet, in Winston-Salem, N.C., there’s a different kind of anti-incumbent fever sweeping through the races for the Winston-Salem/Forsyth County Board of Education. Here at my site, I’ve documented over-and-over, time-and-time again the outrageous anti-gay zealotry and bigotry exhibited by members of this board. As an alumnus of their district (RJRHS ’04), I know first-hand the effects of this board’s inaction. In high school, I joined with local advocates in attempting to persuade these people to do something about the rampant anti-gay harassment and bullying in their schools. Their response was nothing short of jaw-dropping: board members either treated us with silence and a cold shoulder, or others chose to make purely hateful, anti-gay comments all of which are recorded and documented by area media. Pam and her host of Blend baristas have also become attuned to not only the words, actions and beliefs of America’s religious right, but also of those in this state and in Winston-Salem. The board of education there is overwhelmingly composed of incumbents who’ve had their seats for almost a decade or longer. In the same amount of time, local advocates’ pushes to get the board to do anything at all to protect LGBT students went no where. And, after all that time, the Winston-Salem/Forsyth County Board of Education was ultimately forced to protect LGBT students when the state legislature passed the School Violence Prevention Act in 2009. Yet, board members there continue to ignore real problems. They might have an inclusive policy, but that doesn’t mean its being enforced. 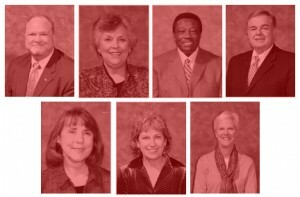 Longtime advocate Janet Joyner, a former five-year member of the State Department of Education’s Safe Schools Advisory Board, is circulating an in-depth history of the Winston-Salem/Forsyth County Board of Education’s anti-LGBT actions. The document, which you can read after the jump, is extraordinary. That any school official, elected or otherwise, would go to such amazing lengths not to protect students boggles the mind and chills to the bone. The board of education is being reelected, finally, on non-partisan tickets. Joyner and a host of other advocates are hoping the non-partisan races will give them a chance to defeat longtime, anti-LGBT incumbents. I encourage you click on past the jump and read Joyner’s history below. It’s a shocker, and all the proof anyone needs to vote against every incumbent on this board of education on Tuesday. 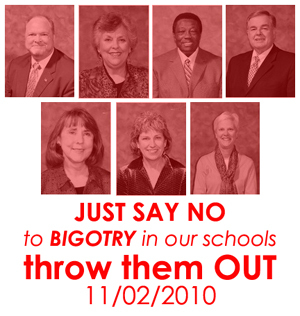 Say NO to BIGOTRY in our schools. Throw Them Out! Visit the Facebook Group and spread the word. Anti-gay pol to step down in N.C.
North Carolina state Sen. David Hoyle (D-Gaston) announced Dec. 9 he’d step down at the end of his term in 2010. 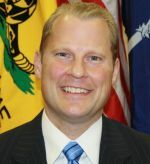 Hoyle, chairman of the Senate’s Finance Committee, had been considered the third most powerful member of the Senate’s leadership, after President Pro Tempore Marc Basnight and former Majority Leader Tony Rand. One advocate thinks the senator’s consistent, conservative social views might have played a key role in the body’s slow progress on pro-equality issues. Sing with me… It’s that time of year, when I sit at my desk and research the year, sifting through… o-old stories of important ga-ay news! I was in the office late last night putting our Dec. 12 print issue of Q-Notes to bed. I wanted to get in the office and start work on our last issue of the year. Our Dec. 26 print issue will include a run-down of the LGBT Carolinas’ most important news and happenings over the past year, as well as a profile on Q-Notes‘ Person of the Year 2009. This will be my third “retrospective,” year-end issue since joining the staff in the fall of 2007. As with the previous two years, I’m looking forward to and will enjoy sifting through each of the preceding 25 issues of this year’s papers. Back when Democrat Heath Shuler was running for U.S. House there was an awful lot of talk about how having any Democrat would be better than any Republican. Of course, it really doesn’t matter when the Democrat being elected is just as conservative as the Republican he replaced. Shuler’s 11th District covers the western-most tip of North Carolina. It is a conservative district, no doubt, and he has to answer to the constituents who put him in office. But his anti-LGBT and other conservative stances make him more foe than a friend, something the Democratic Party doesn’t need as more and more LGBT people find the party distrustful and slow to tackle our civil rights.